Nigeria are struggling to find a kit sponsor after German manufacturers Adidas decided not to renew its deal with the Super Eagles. In August, Adidas complained that Nigeria's coach and some players violated contractual obligations by wearing a rival's kit at major events. 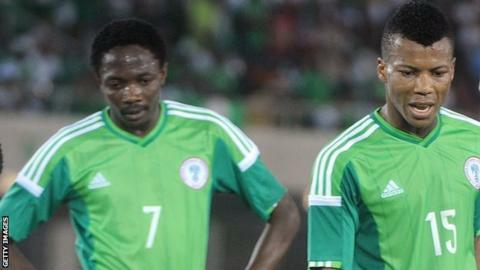 And now Nigeria have lost a deal worth $7m-a-year, which will increase the problems for the cash-strapped team. Nigeria's Football Federation admitted finding a new sponsor is proving hard. The Super Eagles have endured a difficult year, with problems both on and off the pitch damaging their reputation and their results. As well as being penalised with by a global ban by Fifa for government interference in football matters, Nigeria failed to qualify to defend their Africa Cup of Nations title at next year's finals in Equatorial Guinea. And a top official of the NFF told BBC Sport that major sportswear companies are not interested in becoming the country's new kit supplier. But NFF spokesman Ademola Olajire says the body is negotiating with other manufacturers or may still salvage a deal with Adidas. "We currently are in discussions with multiple parties regarding our kit situation," Olajire told BBC Sport. "Despite receiving a notification letter from Adidas initially, we remain confident they could still reconsider their position." Adidas became the country's supplier before the 1994 Africa Cup of Nations in Tunisia, which Nigeria won, and at their maiden appearance at the World Cup in 1994. Nigeria switched to rivals Nike later that year then reunited with Adidas in 2004.